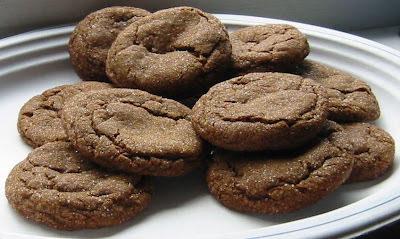 While the Reed math department hunkered down around a case of PBR and blew up each others' dirigibles, I hid out in the kitchen with some bourbon and a hankering for moist, sweet-salty molasses cookies. Like most good clean fun, the LAN party required more set-up than play time -- but it seems to have the same appeal as cookie dough and dominoes and novels about long, tedious courtships. I'm still not entirely sure what L33t Sauce is, but I think it has something to do with PBR. Or maybe it's a cool, tart glass of kefir, which pairs marvelously with soft cookies -- coating them without penetrating to their already-tender interiors. Crunchy or firm cookies are still better in milk. In any case, these cookies were so good that I made another batch this morning before breakfast. You can beat it on medium with a mixer. While I have nothing against mixers in theory, in a quick little recipe like molasses cookies I find them a bit clunky. All that plugging-in, and hunting for the beaters, and washing the beaters, and then the server crashes again and everybody dies. 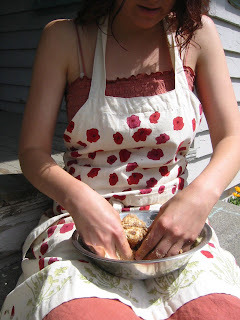 Instead, I go all primal and knead the butter and sugar together with my (clean) fingers. The benefits are manifold, but the best is that there really is no commercial moisturizing product quite like creamed butter and sugar. The sugar crystals gently exfoliate and energize your tired skin, while the butter cools, conditions, and seals in moisture. Knead lavishly. Whisk until lightish and fluffy. Add the dry ingredients, mix until just combined, and shape into 1.5" balls. Roll the balls in a little bit of white sugar to make them sparkly and arrange on a parchment-lined cookie sheet about two inches from each other. Ooh, you could even add a sprinkle of coarse sea salt to the rolling-sugar, and reduce the salt in the dough. Bake till the cookies are lightly fissured on top, pull them from the oven, and let them cool just a bit on the cookie sheet before removing them to a cooling surface (rack, flattened paper bag, your mouth) and popping the next trayful in the oven. Even leaving them on the cookie sheet too long can darken them: the key to gooey molasses delight is minimal baking. I remembered to call Mama this morning but n00blike totally forgot that I'd just put the last batch in the oven. pWnage. I enjoyed this even though you forced me to read it. i've made these cookies a few times and they are just fabulous. thanks for sharing the recipe.